Why the long and somewhat bizarre title? Well, this was going to be Ben's lunch on Wednesday, but he ended up staying home sick. Since it was already packed (and it's not like I wouldn't have used the same refrigerated food for Faith anyhow), it became Faith's Friday lunch. However, she did have to take it in the Thomas bento, with the Shinkansen yogurt container & use the Ratatouille lunchbox. I wasn't repacking anything. I just wanted to say thanks for your blog. 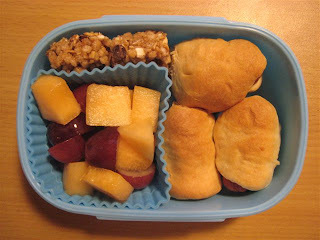 It has really inspired me to "think outside the box" in creating special lunches for my kiddos. What a cute idea! I stumbled upon your blog using a link from my friends blog! Thank you for sharing your ideas!